No one wants to be in an accident. But if you are you can have confidence that when you bring your car into our paint and body shop, you have brought your car to the collision repair experts. Below you will find all of our contact information so that we can be reached at your convenience. 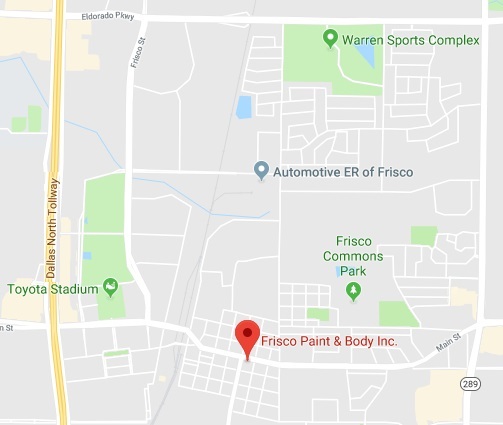 If you have any questions or we can assist you in any way, please contact Frisco Paint & Body, Inc. at 972-335-3515. Frisco Paint & Body, Inc.
Quality Perfection with a Family Touch! Monday – Friday: 8:00 a.m. - 6 p.m.
We hope you enjoyed your tour of our website and we look forward to serving you soon. Thank you for your interest in Frisco Paint & Body, we look forward to serving you in the near future! © 2015-19 Frisco Paint & Body Shop, Inc. All rights reserved. Site designed by Brymels & Associates.